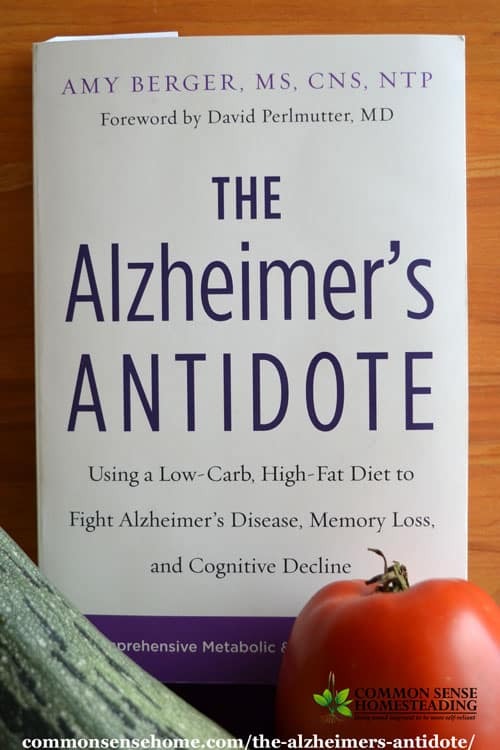 “The Alzheimer's Antidote – Using a Low-Carb, High-Fat Diet to Fight Alzheimer's Disease, Memory Loss and Cognitive Decline” provides real options to those desperately in need. We don't have to resign ourselves or our loved ones to living as a shadow of ourselves. Through proven diet and lifestyle changes, we can dramatically improve quality of life, either by avoiding illness or reversing damage that has already been done. Are the changes easy? For most of us, probably not. The Standard American Diet is killing our brains, and it's addictive. The more important question is what's it worth not to lose who you are? Why am I talking about Alzheimer's on a homesteading site? A well functioning mind and body make self-reliance activities a lot easier to tackle. I know many of my readers are getting older, and I'm not getting any younger. Mom always said it was hell to get old. In the end, her body gave out but her mind was still sharp. My grandmother was the opposite. She was still able to get around, but just sat, confused. I want better options for me and my loved ones, and you and those you care about, too. I received a copy of this book for review. As always, my opinions are my own. Dementia is a general term for a decline in mental ability severe enough to interfere with daily life, for instance, memory loss. So – all Alzheimer's cases are a form of dementia, but not all dementia is due to Alzheimer's disease. This book focuses on improving brain function based on metabolic issues, but does not address traumatic brain injuries. What is The Alzheimer's Antidote? In part 1, we learn how the brain works. After all, you wouldn't try to fix a tool without knowing how it's supposed to work in the first place, right? The concepts are a little complicated at times, but the author explains the ideas with examples and metaphors to make them accessible to the layperson. The author shares the latest research on brain function, diet and lifestyle. Alzheimer's disease is sometimes referred to as “type 3 diabetes”. After reading section one, you'll understand why. Normally, the brain runs on glucose. In Alzheimer's patients, that pathway stops working. It's like your gas generator suddenly being unable to run on gasoline. Luckily, our bodies come with a built in conversion kit so we can switch fuels. Instead of glucose, we switch to ketones, which are provided from fat. Part two shows you how to make the changes. Other factors also play a critical role in brain health. Exercise, stress relief, sleep and intermittent fasting are addressed in part three. To help make the transition, part 4 details a strategy of implementation, as well as nutritional support and supplements for Alzheimer's disease and general cognitive health. Basically, most of the “health advice” we've been given for the last few decades is bad – very bad – for our brains. The good news is that we can make changes. It's never too early or too late to give it a try. The diet and lifestyle changes outlined in the book may also be helpful for other conditions, too. Many of the recommendations are similar to what I've done to put my psoriasis into remission. 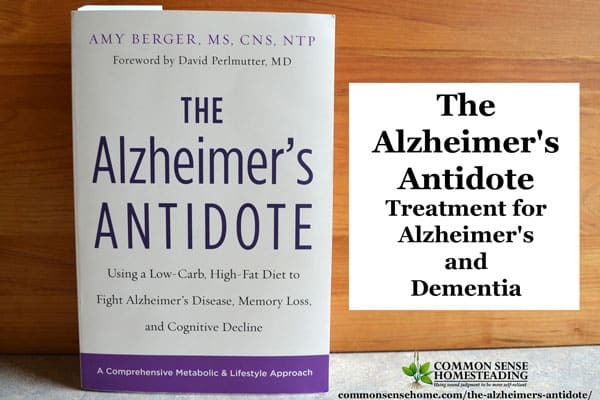 If you're concerned about your brain health or the health of someone you care about (or if you're just tired of forgetting where you left the keys), The Alzheimer's Antidote is worth a read. Nice review, Laurie, thank you. I bought into the low fat stuff for a bit when I was younger, but I personally use butter, mayonnaise, etc. I will never take a statin or PPI (that’s the nurse in me speaking, too well aware of the side effects). Carbs are a hard one, but we are working on that. Big Pharma and Big Food have WAY too much control today, esp via advertising. Advertising and policy making. It drives me crazy that they have soft drink companies on healthy eating committees. The amount of influence carried by lobbyists is also out of control.